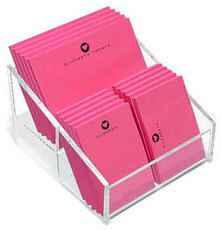 Set of 1500 Post-it® sheets on 30 pads with flat printed on pink stock with black ink. Includes ten 4"x3" pads, ten 2"x3" pads and ten 3"x2" pads. Each pad includes 50 sheets per pad. Optional..
Set of 1500 Post-it® sheets on 30 pads with flat printed in ink as shown. Includes 10 4"x3" pads with adhesive on 4" side in 2 designs; 10 2"x3" pads with adhesive on the 2" side in 2 designs; and 5..
Set of 1250 Post-it® sheets on 25 pads with flat printing in ink as shown. Pads Included are: • 5 - 4"x3" pads with adhesive on 4" side, printed with full..
Set of 1250 Post-it® sheets. Total 25 pads with 50 sheets per pad. Flat printed on pink stock with black ink. 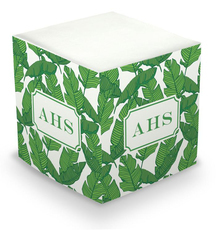 Includes 5 4"x 3" pads with adhesive on 4" side; 10 2"x 3" pads with adhesive on the 2"..
Add some sweet style and pretty color to your desk with these personalized sticky note cubes. Each self stick memo pad measures 3 3/8" square and has 675 sheets. Personalized on all 4 sides. Flat..
Set of 1500 Post-it® sheets on 30 pads with flat printed in ink as shown. Includes 10 4"x3" pads with adhesive on 4" side in 2 designs; 10 2"x3" pads with adhesive on the..
An exclusive design to The Stationery Studio. Set of 1500 Post-it® sheets on 30 pads with flat ink color and paper color of your choice. Includes ten 4"x3" pads with adhesive on 4"..
Set of 300 full color 4"x3" Post-it® Notes. Includes 6 pads, 50 sheets per pad. Flat printed in ink color as shown. Optional acrylic holder available. Upper/lowercase typestyle, format & positioning..
Set of 1250 Post-it® sheets on 25 pads with flat printing in ink as shown. 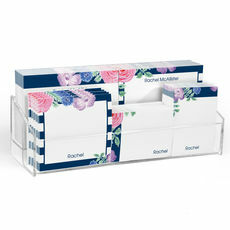 Includes 10 4"x3" pads with adhesive on 4" side printed with full name; 10 2"x3" pads with..
Add style to your desk with a gorgeous personalized sticky note cube featuring a bouquet of stunning chrysanthemums. Each cube is 3.375" square and with 675 sheets. Personalized on all 4 sides. 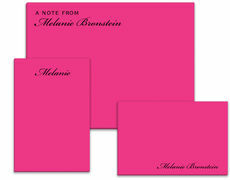 Flat..
Personalized feminine-styled Post-it® notes are available in many colors, sizes and styles. 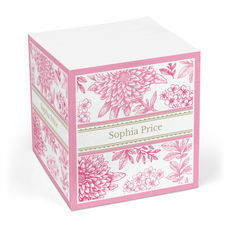 A feminine note set may include bright colors, whimsical designs or elegant details. 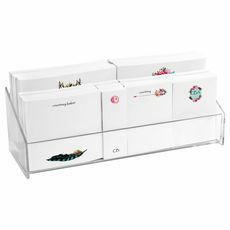 With the option to personalize Post-it® notes with a monogram, initials or name, you will enjoy choosing a very unique, high-quality custom gift for yourself, a friend, family member or co-worker. The sticky back of each Post-it® note makes it convenient to quickly attach a note to nearly any surface. 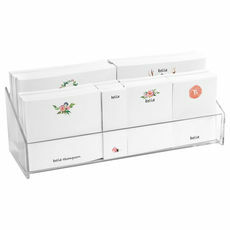 The variety of our personalized feminine-style Post-it® notes offers a size and shape for any need. Whether you purchase sticky notes in solid colors or fun shapes, they are a convenient way to quickly label items or leave memos for others. 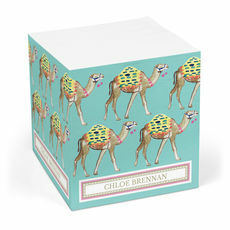 Personalized Post-it® notes allow you to communicate with style and with a flair that is uniquely yours. 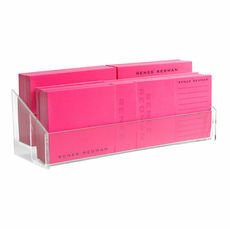 You can choose Post-it® notes in your favorite color or with graphics that reflect your career, hobbies or interests. Adding your monogram or name to customize your Post-it® notes will add a touch of personality whether you choose an elegant script or clean block letters. 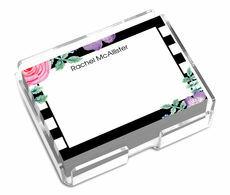 Customized feminine Post-its® can be thoughtful gifts for friends or family members. 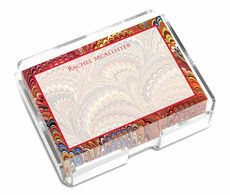 The many beautiful styles, designs and note sets we offer make giving a customized gift simple and fun. 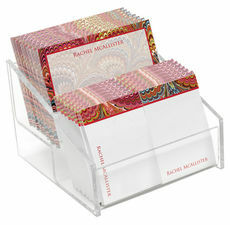 Classic patterns such as chevron, paisley, polka dots and floral desigs add color to a friend or coworker's desk. 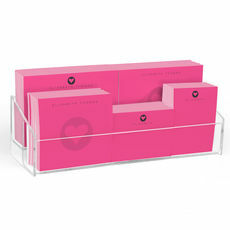 If you're looking for a way to organize a Post-it® ensemble set, acrylic display stands are available for many sets as well.